President of the World Bank, Jim Yong Kim, is warning that the combined crises of planetary climate change and rising global inequality in a highly interconnected world will lead to the rise of widespread upheaval as the world's poor rise up and clashes over access to clean water and affordable food result in increased violence and political conflict. As Jim Yong Kim warned of the risks of climate change, the UN said food prices had risen to their highest in almost a year. In an interview ahead of a bank summit next week, Kim predicts that battles over food and water will break out in the next five to ten years as a direct result of a warming planet that world leaders have done too little to address, despite warnings from the environmental community and scientists. "The water issue is critically related to climate change," Kim told the Guardian. "People say that carbon is the currency of climate change. Water is the teeth. Fights over water and food are going to be the most significant direct impacts of climate change in the next five to 10 years. There's just no question about it." Despite the acknowledgement of the problem, however, and even as he made mea culpa for past errors by the powerful financial institution he now runs (including a global push to privatize drinking water resources and utilities), Kim laid the blame on inaction on the very people who have done the most to alert humanity to the crisis, saying that both climate change activists and informed scientists have not done enough to offer a plan to address global warming in a way he deems "serious." He said: "They [the climate change community] kept saying, 'What do you mean a plan?' I said a plan that's equal to the challenge. A plan that will convince anyone who asks us that we're really serious about climate change, and that we have a plan that can actually keep us at less than 2C warming. We still don't have one." Kim also acknowledged the threat of unaddressed inequality, saying that access to the internet (mostly through smartphones) in the developing world has created conditions where everyone on the planet knows how other people live, which means that the "next huge social movement" could erupt anywhere at anytime. "It's going to erupt to a great extent because of these inequalities," he continued and said heads of state from around the world have called for "a much, much deeper understanding of the political dangers of very high levels of inequality." The question remains: Do these acknowledgements of the dual crisis of a warming, less equal planet from the leader of the World Bank really translate into a transformation of the institution that is well known as one of the key proponents of the policies and projects that have led us to this point.? According to a new report the World Resources Institute, the answer remains: No. 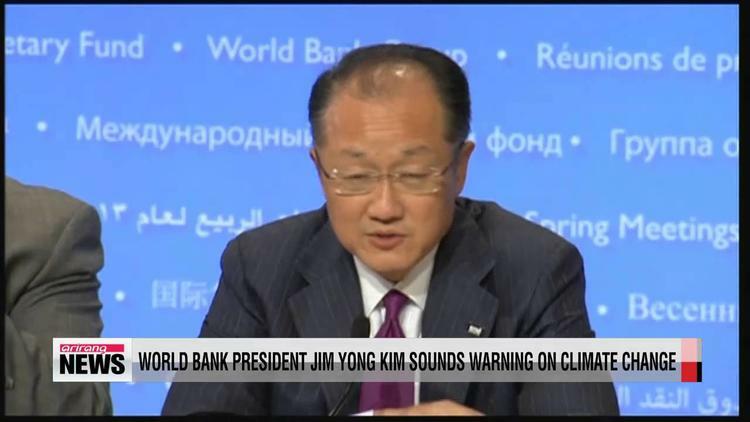 The new analysis from WRI says that despite Kim's recent rhetoric and focus on "sustainability" for the bank, the reality "shows that while the World Bank has successfully addressed a number of important economic and social risks in its projects, it is falling short in recognizing climate risks." Out of 60 recent World Bank projects assessed, according to researchers, "only 25 percent included features that took climate change risks into account. This shortfall could leave communities vulnerable to extreme weather, sea level rise, and other climate impacts—impacts that threaten to undermine the World Bank’s efforts to eliminate poverty."